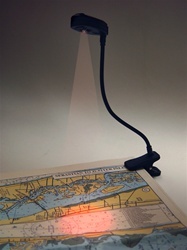 Clip-on red LED chart and reading light for night vision protection; light where you want it. Lightweight and compact with flexible neck, uses 2 x CR2025 coin batteries included. Coil it up and slip into your pocket.